Anyone walking into a salon for a personal care service wants one result: a relaxing, indulgent experience that ends with a refreshed feeling and more polished appearance. Alex Ta and his team at Pretty Nail & Spa invite you to have that consistent experience every time you visit their nail salon and spa at Plantation Center on Hilton Head Island. With services including manicures, pedicures, facials, massages and waxing, Ta has created a relaxing atmosphere where his team of skilled technicians provide superior services for ladies and gentlemen. “I have friendly people working here who are all licensed technicians,” Ta said. Each member of his crew has over 10 years of experience and keeps current with the latest products and services through continuing education opportunities, he explained. With nail technicians, masseurs, skin and brow specialists, and other talented professionals, Pretty Nail & Spa offers an array of soothing spa experiences for all. Originally from Vietnam, Ta came to the U.S. in 1997 on a student visa and has since become a U.S. citizen. He holds degrees in business, hotel management, and finance as well as nail technician and massage licenses. Merging his business expertise, training, and past spa experience, Ta opened his first nail salon on Hilton Head Island in 2013 and now brings the sum of all his knowledge and experience to his latest venture at Pretty Nail & Spa, serving locals and area visitors for the past year and a half. Customers who are blessed with strong natural nails may opt for a classic manicure, starting at an affordable $16. Other popular nail treatments include gel manicures, acrylic enhancements, and the newest and most popular nail service to date: dipping powder. Dip powder manicures are the fastest growing method of color application in the salon business, according to Ta. The concept is simple. Instead of applying liquid colors to the nail, an adhesive base is applied and then dipped in fine colored powder (over 600 colors available at Pretty Nail & Spa). The nail is then sealed with a special top coat. Known for its lasting power (14 days or longer, guaranteed chip free), the method is not only durable, but unlike other products, can improve the health of your nails. “It has vitamin E and calcium, and makes your nails very strong,” Ta said. It won’t stain your nails as some traditional polishes can; it also dries instantly and does not require UV lights, he explained. In addition to classic pedicures, hot stone treatments are also offered at Pretty Nail & Salon. Hot stones and essential oils are used to massage the legs and feet, stimulating pressure points and relaxing your muscles. For the ultimate indulgence, try the reflexology pedicure, which targets 12 meridians to redistribute energy and banish stress. 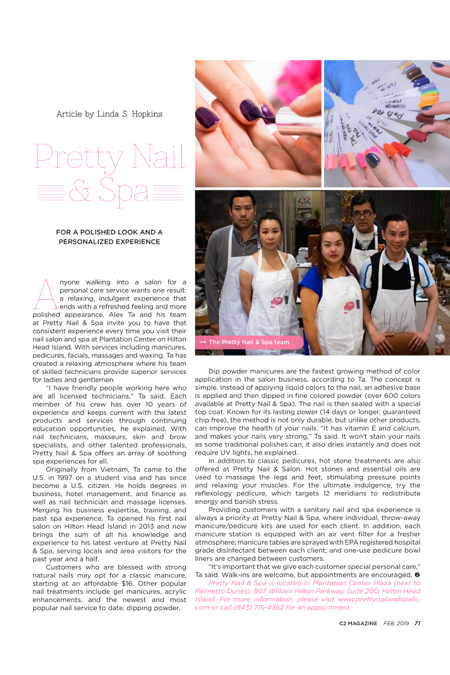 Providing customers with a sanitary nail and spa experience is always a priority at Pretty Nail & Spa, where individual, throw-away manicure/pedicure kits are used for each client. In addition, each manicure station is equipped with an air vent filter for a fresher atmosphere; manicure tables are sprayed with EPA registered hospital grade disinfectant between each client; and one-use pedicure bowl liners are changed between customers. “It’s important that we give each customer special personal care,” Ta said. Walk-ins are welcome, but appointments are encouraged. Pretty Nail & Spa is located in Plantation Center Plaza (next to Palmetto Dunes), 807 William Hilton Parkway, Suite 200, Hilton Head Island. 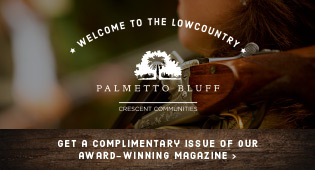 For more information, please visit www.prettynailandspallc.com or call (843) 715-4362 for an appointment.